Washington, DC—For the first time in five years, amid transformation in the auto industry, the Detroit Three automakers do not have a single car on the annual Greenest vehicles list. As they make deep cuts to their car fleets, their prior green superstars are either being discontinued, lagging behind, or not yet on the 2019 market. Still, there’s good news for consumers. Highly efficient powertrains and state-of-the-art technology provide plenty of options for buying a greener, more efficient vehicle, according to the 22ndGreenerCars ratings, released today by the American Council for an Energy-Efficient Economy. The federal government shutdown is keeping the Environmental Protection Agency from providing some 2019 models with the certification that automakers need to begin selling them—and that GreenerCars needs to score them. This includes a few vehicles that are expected to score very well, including the Toyota Prius and Tesla Model 3. Today’s release includes the vast majority of model year 2019 vehicles, but ACEEE will score the missing ones in coming months and give them a fair shot at the Greenest List. The 2019 Greenest List features the most environmentally friendly cars now available. Each car is given a Green Score based on an environmental damage index (EDX), which reflects the cost to human health from air pollution associated with vehicle manufacturing, the production and distribution of fuel or electricity, and vehicle tailpipes. Scores for some battery electric and plug-in hybrid vehicles dropped since last year, the result of a change in the GreenerCars scoring model that updates the accounting of emissions associated with battery manufacturing. Even so, battery electric and gasoline hybrid models dominate the Greenest List, allowing consumers to minimize the environmental impacts of their next vehicle. 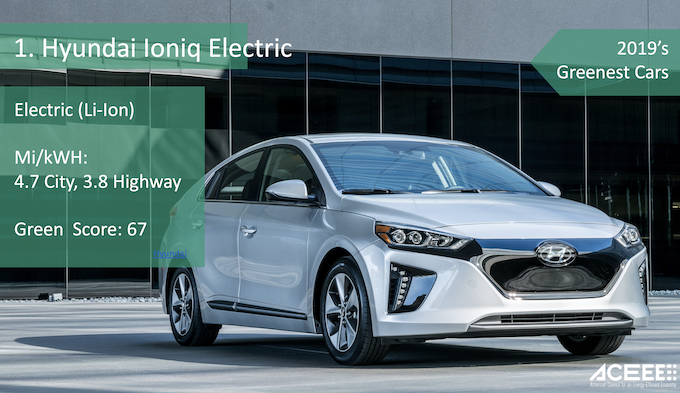 The Hyundai Ioniq Electric holds its top spot for the third year, with a Green Score of 67. Other regulars include the BMW i3, Kia Soul Electric, and Nissan Leaf. “By turning to clever vehicle designs and state-of-the-art batteries, automakers are making many of their offerings more efficient, at lower cost,” Junga said. He noted that all electric vehicles on the Greenest List start pricing below $45,000 before tax incentives, and most tout a rated driving range of over 150 miles, bringing EVs one step closer to becoming mainstream vehicles. Even though federal EV tax incentives have begun phasing out for some automakers, prices are dropping and state tax incentives may still be available. Consumers may want to inquire about incentives. For those with requirements not quite met by current EV offerings, gasoline hybrids are a great alternative. Popular models make the Greenest List, including the Hyundai Ioniq Blue, a gasoline hybrid sibling to the first-place Ioniq Electric. Toyota’s mid-size Camry Hybrid LE is not only practical but boasts stellar fuel economy. Falling just short of the Greenest List and soon to be discontinued is Chevrolet’s plug-in Volt, one of Chevy’s most efficient models over its nine-year run. For the fourth consecutive year, the Greenest List contains no vehicle with solely an internal combustion engine. Manufacturers continue to make impressive strides in the efficiency of gasoline engines, but adding even a small degree of electrification can further reduce a vehicle’s lifetime environmental impact despite the emissions from producing batteries. Greenercars.org also identifies practical options in each class among widely available, automatic transmission, gasoline, or diesel models. The Greener Choices list includes conventional vehicles and traditional hybrids, but excludes plug-in hybrids and pure battery electric vehicles, given the limited availability of charging stations. The all-new RAV4 shows an impressive five-point jump since last year, the result of Toyota’s own efforts to maximize the efficiency of gasoline engines. Chevrolet’s Spark proves that efficiency can come in an affordable package, while the utilitarian Nissan Rogue Hybrid makes a repeat appearance. Meanwhile, Honda’s all-new Insight grows in size and practicality, while easily out-scoring the iconic marque’s earlier generations. Greenercars.org also provides a Meanest List, comprised as usual of large SUVs, pickup trucks, and European luxury cars that are the least friendly to the environment. For the first time in many years, Mercedes’ G550 is not the worst of the worst. The recently redesigned luxury SUV improves combined fuel economy from 11 miles per gallon to 14 miles per gallon, just enough to reach the fourth-worst score of 2019. Green Scores of the 1,200-plus model year 2019 vehicles are available for free in the greenercars.org interactive database, along with each configuration’s fuel economy, health-related pollution impacts, and greenhouse gas emissions. Visitors can also turn to GreenerCars scores to determine eligibility for parking benefits at participating LEED-certified buildings. Greenercars.org also features a write-up on model year 2019 market trends and shopping advice, as well as a consumer primer on vehicles and the environment. Changes to this year’s methodology include updates to estimates of vehicle lifetime miles traveled, emissions associated with electricity production, and emissions from the manufacturing and recycling of vehicles and their components.